Seriously, I mean it. I really love the Germans. They’re largely a humorless bunch, but I’m OK with that. It took some learning, but I have finally figured out that I must leave my sarcastic wit at the hotel when I have meetings with German business people. But, that’s my fault – shame on me for my cultural insensitivities. So, I’m here in Germany now and was just reminded, by one of the little things, why I love the Germans so much. I’m here on a whirlwind trip during which I’m passing through Holland, France, Germany, Switzerland, and London in 5 days. 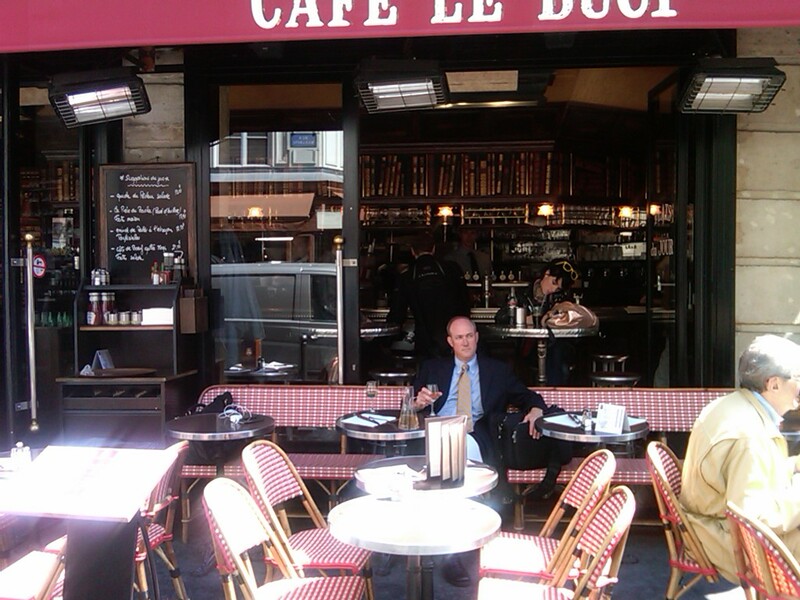 To digress for a moment, I will stop short of saying I love the French, but I do love France (my friend, Pete, once said, “France would be great, were it not for the French.”). We sit here in the US making fun of their 35 hour work weeks and 2 hour lunches that involve 2 bottles of good wine while we, um, work our asses off for 70 hours a week and drink 2 cans of Diet Mountain Dew at lunch. Excuse me. Tell me again who should be laughing at whom? Remind me who has this whole work/life balance thing backwards? 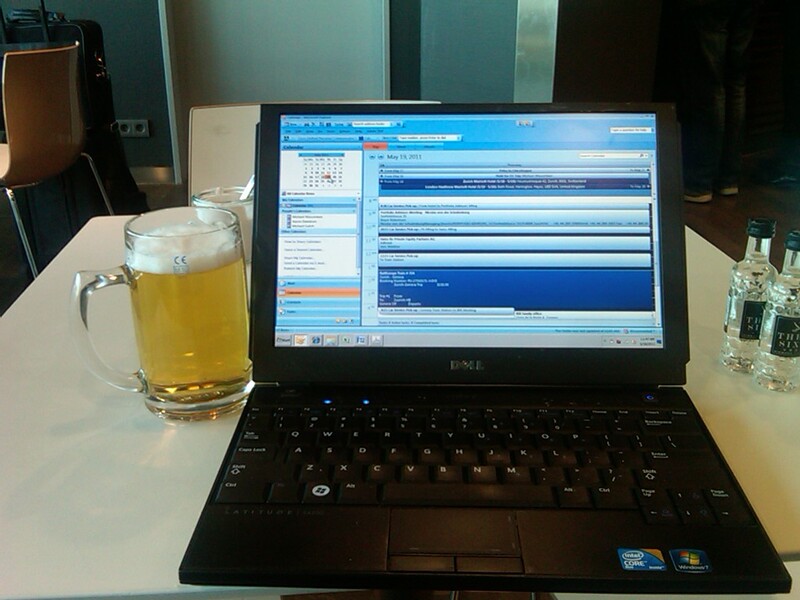 Now, if you go to the average airline lounge in Atlanta or Washington or Miami, they will have a bar and you can certainly order a beer. Probably a Miller Lite. And, they will likely have a reasonably fancy coffee machine that can dispense several different varieties of putrid coffee by selecting different buttons on the machine. But, here’s what they will not have – a special self-serve tap from which can select a beer with specific level of foam. Check out the options for size of foam head! Seriously, check out the photo. 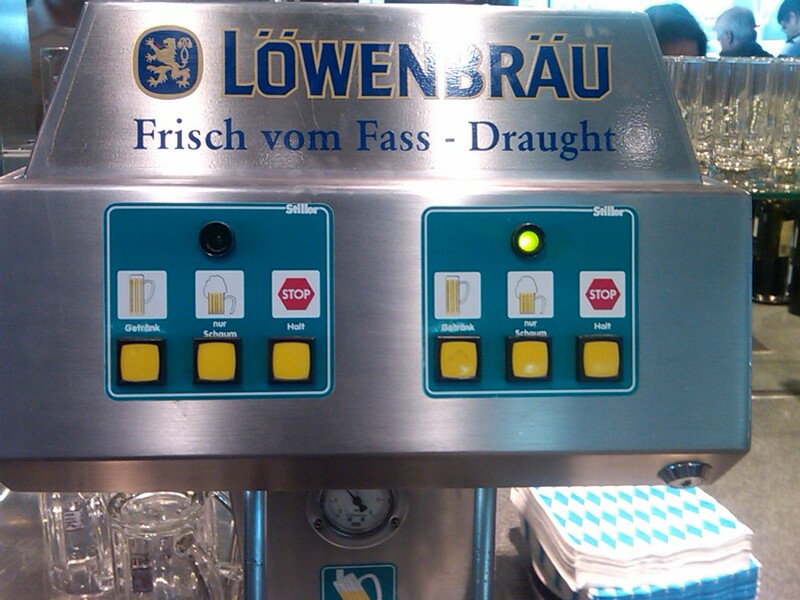 There’s a Lowenbrau (the real one, not the crap you used to be able to buy in the US) tap where you can push the button on the left to get less head or the button on the right to get more head on the beer. Please click on the picture to enlarge it to really appreciate this genius. I have to confess that in all my years of beer drinking, I have never once been asked “how much foam would you like in your beer?” No, you just get what you get. A freshly tapped keg at a college fraternity party might yield 6 inches of foam. An ice cold beer in a frosty glass, none. But, it really isn’t your choice. To use an expression I hate, it is what it is. Not in Germany. They may be too serious to understand my hysterically funny wit, but, damn, they are serious about their beer. Think about it – there’s probably no place in any country less likely to offer you a bunch of choices than an airport lounge. But, even at the airport lounge, the Germans are so serious about their beer that you get to choose the amount of foam you get…..from an automated tap. In case you’re wondering, I went with the button on the left. After my ordeal, I needed more beer, less foam. But, I was most grateful to have the choice. Perfect head on this beer. Note the mini-Vodkas I snagged just in case the beer didn't calm my nerves. Bruce, now you understand the Niehaus/Schmutte heritage. We are built strong and sturdy, we are hard workers, and we take our beer seriously. and when I show Mark that machine, he will build one. btw, he is in England, been there all week. He like those pubs! Yes, I do like the pubs. Currently in the Hilton at the Birmingham airport, so I can fly home tomorrow. In the UK I get to drink the hand pumped cask ales. (Last night was “Pie and and Pint” night” at the pub near the hotel in Gloucester.) BTW, I spent all week with my collegue from Germany, and the sarcasim definitely flies right by! To me, the inability to understand wit (irony, sarcasm, etc.) is just a sign of low intelligence. But hey, that might just be me.